If you’ve followed Rachel’s Ruminations for any length of time, you’ll know that I struggle with my fear of flying. 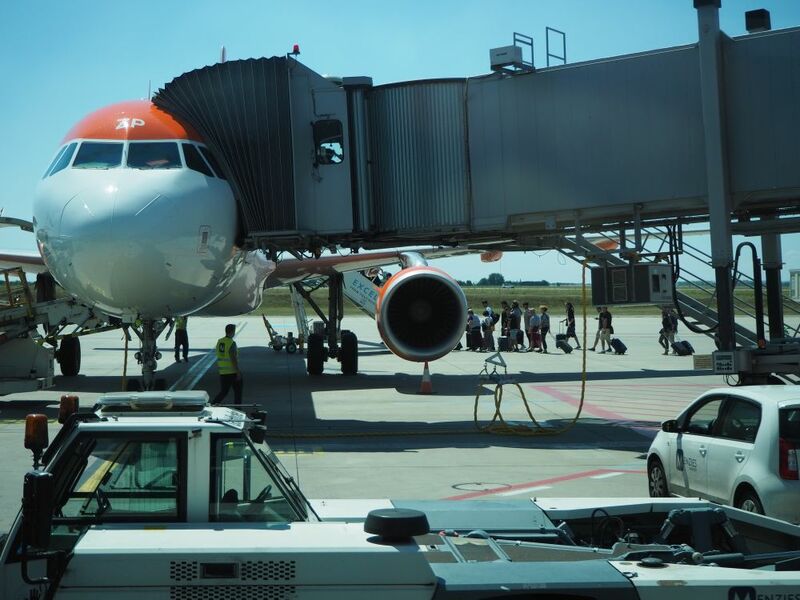 So, naturally, when bloggers attending the TBEX conference in Ostrava, Czech Republic, last month were invited to a Prague Airport tour, I jumped at the chance. “Face your fear” and all that. Why take the Prague airport tour? One of the things that seems to help my fear of flying is greater knowledge. For example, soon after take-off, there’s a moment when it feels as if the airplane is slowing down and falling. I used to experience a moment of panic at that point: what’s happening? Is something wrong? Why are we descending again? It turns out that that motion is perfectly normal: the airplane’s acceleration does not need to be so high anymore, and its path does not need to be as steep. The pilot is, essentially, easing off on the gas and leveling the plane’s path a bit. From my point of view, it may feel like falling. In fact, it’s just climbing a little less steeply and a little more slowly. Knowing this fact has helped me deal with it, and generally that moment of panic doesn’t happen to me anymore. fly over Prague in a small plane. As you can imagine, I was nervous about the small plane ride. I told myself I could handle it, and I really wanted to see the rest: the baggage handling in particular. It’s always amazed me how they manage to handle so much baggage with so few problems. We met our tour leaders in one of the lounges: “just follow the red carpet,” we were told. Recently renovated, the Raiffeisenbank Lounge has a sixties retro style to it: all yellows and oranges and curved corners. A brief introduction to the airport and its ambitious plans for expansion, and the tour began. We were each issued a badge to wear, and for every behind-the-scenes location we saw, someone had to check us in and out again. Security is not taken lightly, as you can imagine. For me, it was reassuring that we were not just waved through. We didn’t see much of security, but apparently that was because of, well, security. I guess it’s best not to let outsiders know too many secrets. The operations center is not the same thing as flight control (which we didn’t get to see). It’s the place that controls everything that happens on the ground before planes leave and after they land. Once they are in the air, responsibility is handed over to flight control. The operations center is a remarkably calm place. Just two people were busy working when we visited, each surrounded by a bank of screens. The wall in front of them held screens too, showing various live feeds and schematic maps. 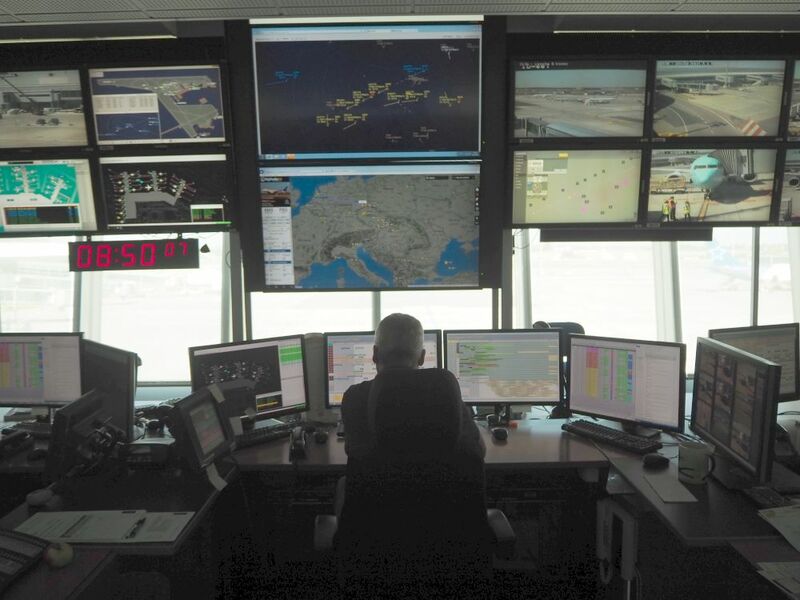 The operations control center at Prague Airport was a dark, quiet, calm place. The guide’s story about what the operations center does made me realize how much improvisation happens backstage at an airport. Each morning starts with a plan and a schedule: landings, take-offs, gate allocation, etc. Different airplanes demand different gates, for example. An A-380 like the ones Emirates uses needs a gate with two jetbridges to accommodate the two levels of the plane. Prague Airport’s daily plan, in turn, aligns with the plans of all the airports and airlines all over Europe and the world. However, if one plane arrives late or leaves late, the whole day’s plans have to be changed in a way that will inconvenience as few people as possible. That improvisation is what happens in this office. After donning brightly-colored safety vests, we entered the baggage handling facility. In this cavernous space, a huge conveyer belt rumbled around on a track above our heads. At ground level, electric vehicles passed. Climbing a stairway afforded us a better view, and we could see that the conveyer belt carried flat trays with raised edges. Now and then a piece of luggage sat on a tray that came by. The trays tilted as needed, neatly depositing the luggage into chutes leading to, for example, a large x-ray machine. This photo shows only one section of the baggage handling hall. I couldn’t get the whole thing in one picture! The lanes for the electric vehicles are indicated on the floor. The conveyer belts are above, and you can see some of the chutes used for moving baggage. This one vast room handles thousands of bags per day, with only, according to our guide, 4-5 misplaced each day. And, as I know from experience, misplaced usually just means late. The guide said that 99 percent of the time, missing bags are caused by human error before bags reach this facility: an error with labeling, for example. 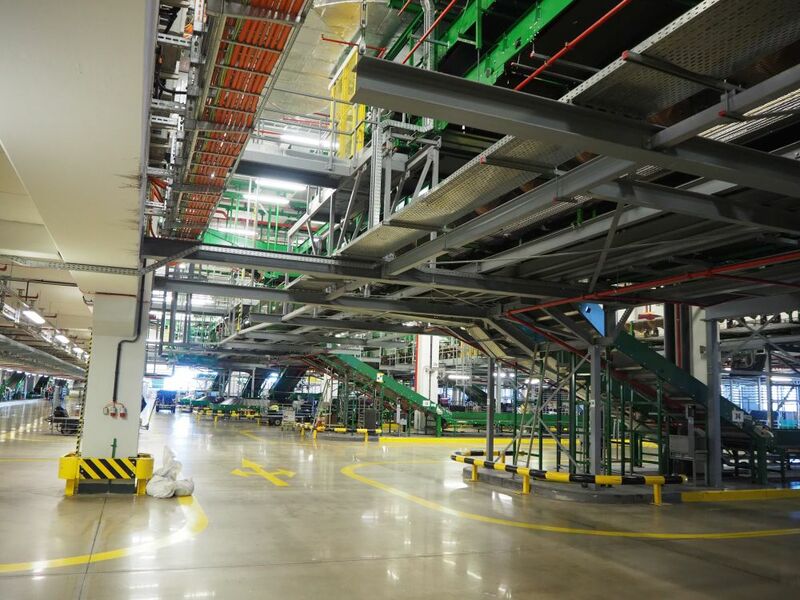 This baggage handling operation is brand new, and is capable of processing even more baggage than it does now. This is part of Prague Airport’s plan for the future: significant growth. Next we boarded a bus to take a drive around the airport. We followed a “road” that was really just painted on the runway, closely skirting the airport building itself. We passed underneath the jetbridges that passengers walk across to reach the planes, so we were very near to the noses of the planes parked at the gates. This was the kind of scene we passed as we drove along the perimeter of the terminals: passengers boarding a flight. I’m not sure why they had to walk when a jetbridge was in place. The guide explained that the airport is made up of one older terminal, terminal 1, and a newer terminal 2, which will be expanded in the next few years, and which is attached to terminal 1. There is also a separate terminal 3 for private aircraft. 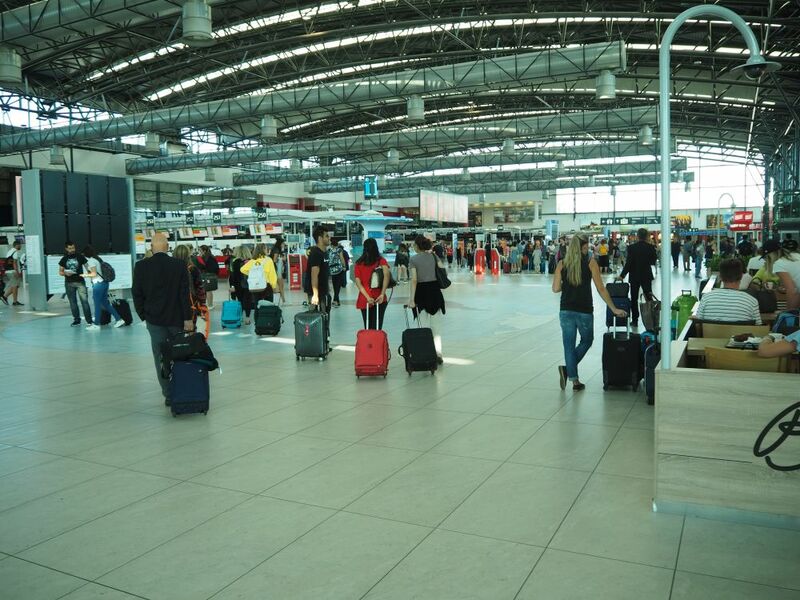 The airport handled 15 million passengers last year and is aiming to handle many more. Next, we divided into three groups so that we could do the next three parts of the tour in smaller numbers. My group went first to see the runway up close. Basically, that’s all this was: an opportunity to film planes taking off without glass between us and the airplanes. 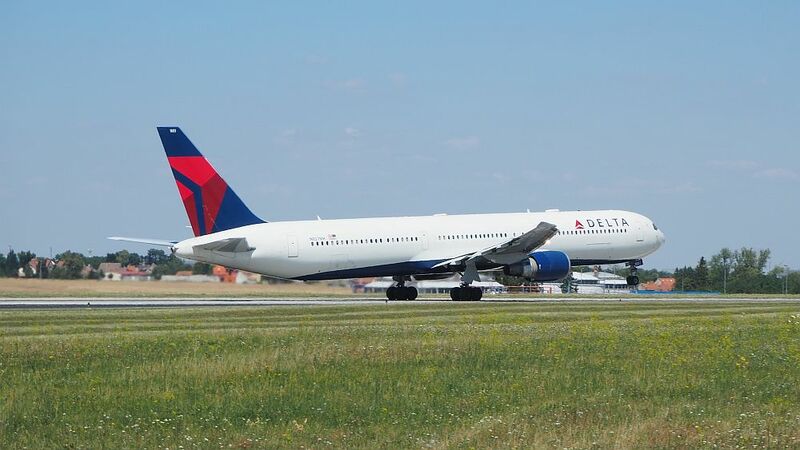 A Delta flight, just after it sped past us and just as it started to lift off the runway. The two dyed-in-the-wool plane spotters in our group (as well as the extremely knowledgeable guide) were able to tell us all sorts of trivia about the particular planes we saw passing by. Our next stop was the fire station. The few firefighters who were there seemed quite happy to show us their fanciest, newest fire engine. It was a massive thing with all sorts of bells and whistles that other fire engines don’t have. 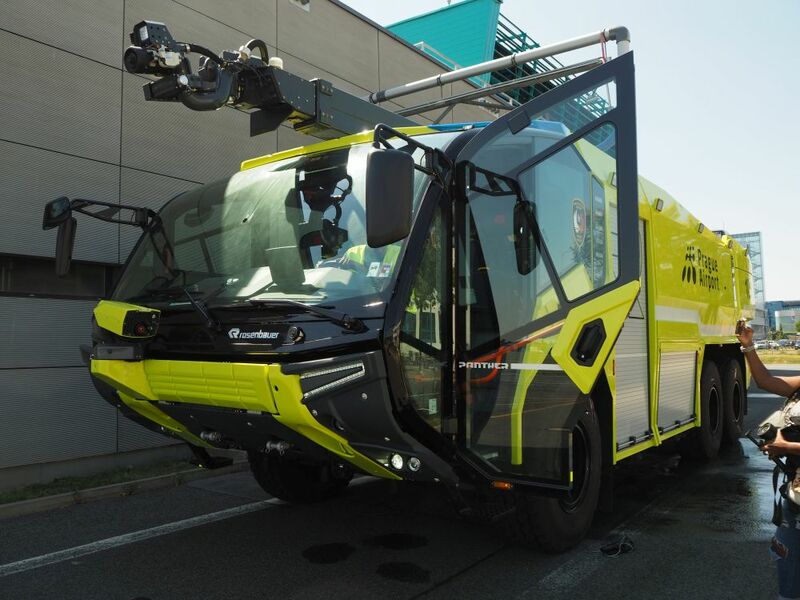 This state-of-the-art firetruck can be operated by just a single person, who doesn’t even have to leave the cab. This fire truck can be operated by just one person, who doesn’t need to leave the vehicle at all. From a control panel inside, he can extend or raise a mechanism to spray water or foam at high pressure precisely where it needs to be. He can spray water underneath the truck, allowing him, if necessary, to drive through flames, putting them out as he goes. We were allowed to climb inside and ride a short distance, and to watch it spray water from the top spout. Our “boys with toys” (the aviation enthusiasts) were all smiles when they were allowed to climb on top of the truck and watch its tank be refilled. The only thing we didn’t manage to photograph was firefighters sliding down poles; yes, this station uses poles. The highlight of our tour was a sightseeing flight. Though the original plan was to circle over Prague itself, we lost our slot by arriving late. This isn’t surprising: every blogger trip I’ve ever been on has run late because bloggers take more time to get that perfect picture and to ask lots of questions. Anyway, it was a “highlight” I dreaded. But I’d decided to do it anyway. The plane was a small Cessna owned by Blue Sky Aviation. This is the teeny-tiny plane we flew in on our tour of Prague Airport. Climbing aboard, I got a real sense of how small the plane is. I had to climb in from the left, while my seatmate, Kerwin McKenzie of Passrider.com, climbed in from the right. Tomiko Harvey of Passports and Grub sat behind us, while Alex Cheban of Alexcheban.com (in Russian) sat in front, next to the pilot. I’m going to try to describe how this whole experience felt, but it’s hard to put into words. First of all, the engine – it was a one-engine propeller plane – sounded to me very much like a motorcycle engine. As the pilot steered us to the runway in preparation for takeoff, I wondered whether it was wise to trust my life to a motorcycle engine. No one else seemed worried, but I didn’t feel very reassured. What did help was that we all wore headphones that allowed us to hear what the control tower, our pilot and other pilots taking off or landing were saying. Their matter-of-fact tone reassured me that everything was normal as far as they were concerned. Sitting right behind the pilot, I couldn’t see his face, but he also seemed calm throughout the flight. He seemed more amused than anything when I told him that I was afraid of flying. So off we went. As we sped up for takeoff, I held Kerwin’s hand – I had let him know ahead of time that it might help. It was an extremely hot day, and the pilot had warned us that there would be turbulence, and there was, right from takeoff. I was able to film the clip below with my smartphone by setting it up before we taxied down the runway. I wouldn’t have been able to focus on it enough to do it once we were in the air. It’s a speeded-up version of the takeoff. I realized on this trip that there is turbulence and there is turbulence. The smaller the plane is, the more you feel it. This little Cessna was not pressurized and had only one small engine, so there was no powering through the turbulence, or that cushioned feeling that some bigger airplanes offer. We felt everything. I soon switched from clutching Kerwin’s hand with my right hand to bracing myself against the side of the plane with my left. That allowed me to use my camera, though it didn’t allow me to adjust its settings. So I clicked away, out my window on the left and in every other direction whenever I had a chance. Meanwhile, on every significant bump, I gasped. These headphones had microphones as well, and I think the pilot heard every gasp. I suspect it kept him entertained on what would have been a fairly routine flight for him. Kerwin took this photo mid-flight. He beamed throughout the flight, enjoying it wholeheartedly. I smiled for the photo; that’s it. Courtesy of Kerwin McKenzie of Passrider.com. Part of me was terrified. I kept imagining that single engine puttering into silence, followed by our slowly accelerating descent to our deaths. I tried to steer my mind away from such thoughts, but every new shake – and they were pretty constant – reminded me that I was strapped into a tin can speeding unnaturally along at the behest of a very small motorcycle engine. At the same time, I found it exhilarating: not the motion (see above), but the views, which were simply breathtaking. The reason I often climb to the top of church towers, for example, or take the elevator to the tops of high buildings like the Burj Khalifa or the Dubai Frame, is to see the views. 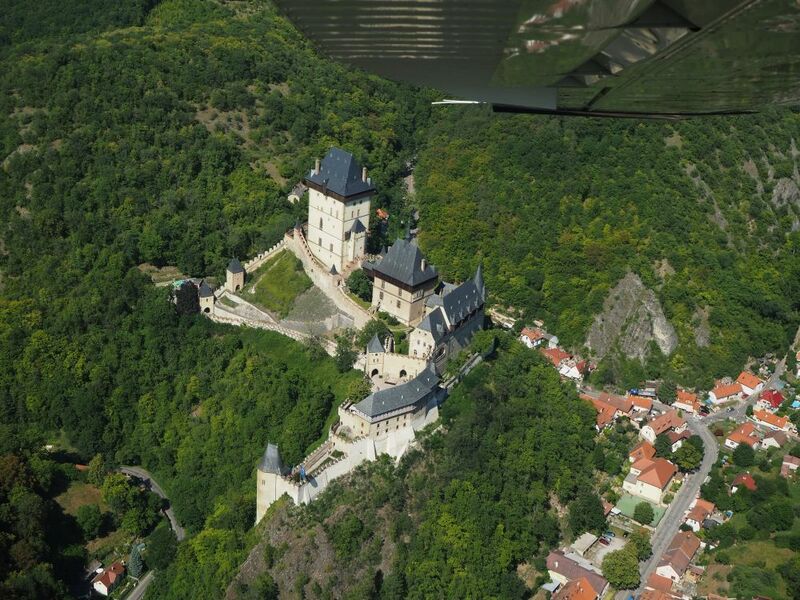 Since we’d lost our slot to pass over Prague itself, we instead flew toward the hilly area to the south of the city. (Factoid: hills and mountains create turbulence above them.) The destination was Karlsteyn Castle, picturesquely nestled in the mountains. Banking left, the pilot did what he could to let us take some great pictures of the castle (and the windows of the plane were remarkably clean). He circled the castle twice banking left, then banked some more in order to circle it twice in the other direction. After all, everyone wanted good pictures. Karlsteyn Castle as we saw it from our flight. You can see the underside of the plane’s wing at the top of the picture. The problem with all that banking, for someone like me, is that it is scary! It feels like a precursor to falling. In a large jet, you barely feel the banking. In this contraption, I felt everything. The worst was the combination of banking and turbulence: we’d be tipped 45 degrees to the ground, and suddenly drop in an air pocket. There was a lot of gasping, all of it coming from me. I snapped this picture of the pilot while we were banking at one point, to give you an idea of the angle I’m talking about. At that moment, he seemed to be looking for something in the left distance or aligning to it or something. It was also extremely hot. This tin can we were trusting our lives to didn’t have air conditioning or even any ventilation, as far as I could tell. The pilot had simply closed his window as we took off, and didn’t – or presumably couldn’t – open it again until we landed. We all sweated. I would have anyway, just from fear, but this made it worse. Ten minutes into the flight, I was ready to go back and land. The whole flight, though, took about 30 minutes. I felt, of course, incredibly relieved to land in one piece. The experience, though, is hard to categorize. I spent the whole flight in a state of tension, terrified of every motion, bracing myself against the window frame until my arm ached. I wished frantically that the pilot would take us back to the airport before the engine died. In a way, I also loved it. It was a highlight of my trip to the Czech Republic, and certainly a first in my history of flying. At the same time, I’m absolutely sure I’ll never do anything like this again. It just doesn’t seem safe. 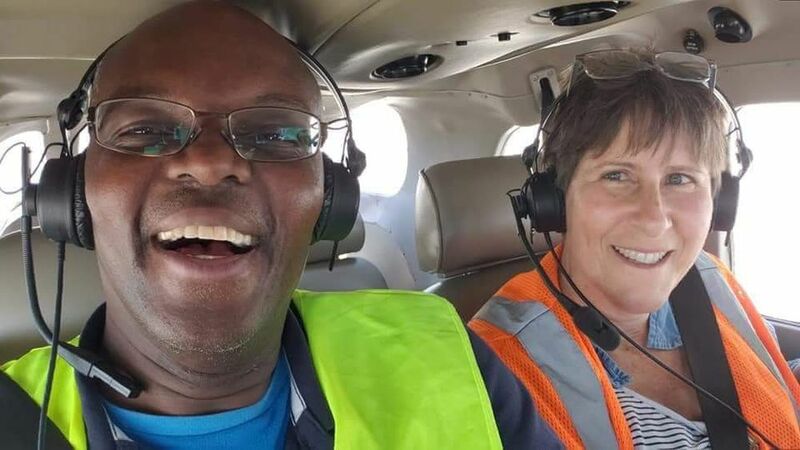 While I spent the whole time hoping desperately that the engine wouldn’t give out, the others – including the other eight who took flights while we were on the runway and the fire station – didn’t seem to have any qualms at all. Perhaps I’m just not trusting enough: trusting of the pilot’s common sense and knowledge, trusting of the mechanic’s skills in maintaining the plane. In any case, I’m proud and pleased that I did it. I also got some good pictures, especially when you consider that I was just pointing and clicking and often not even looking at the camera’s screen. Have you ever flown in a small plane like this? Is it something that you would do? Add a comment below! If you have time to kill in Prague Airport – or really any airport for that matter – I’d certainly recommend an airport tour. It’s a fascinating way to see all the behind-the-scenes activity that we travelers normally don’t think much about. Keep in mind, though, that our special blogger tour was not the norm. 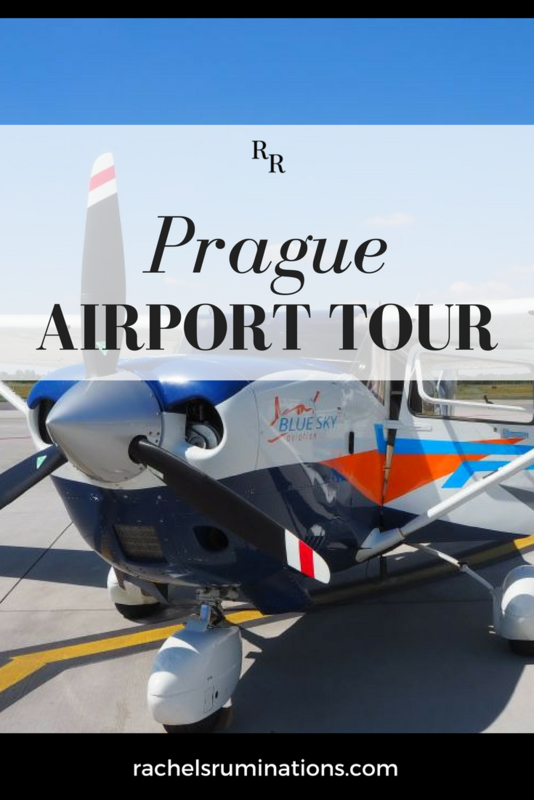 While Prague Airport offers a number of different tours, none of them includes a sightseeing flight. That was added on for our benefit. All tours start at Terminal 3 souvenir shop and must be booked ahead at this site. Keep in mind that this is an airport, which means you’ll have to go through a security check just like when you travel. Don’t bring anything that wouldn’t get through. Tour 1: watching takeoffs and landings and aircraft handling, then a tour inside terminals 1 and 2, including a lounge. Tour 2: bus tour around the airport to watch aircraft handling procedures, getting close to a runway to watch takoffs and landings, then a tour of the fire station. Tour 5: a visit to a hangar to learn about aircraft maintenance, a bus tour of the flight line, and watching takeoffs and landings from nearby. Tour F: specifically for airplane photography enthusiasts, this includes walking beside the runway itself to take lots of photos or film of planes. Cost: Adults CZK220 (€8.60 or $10); Children CZK100 (€4 or $4.50); family and senior citizen rates are also available. Go to this link to read more about the tours. Blue Sky Aviation offers flying lessons on airplanes or helicopters. 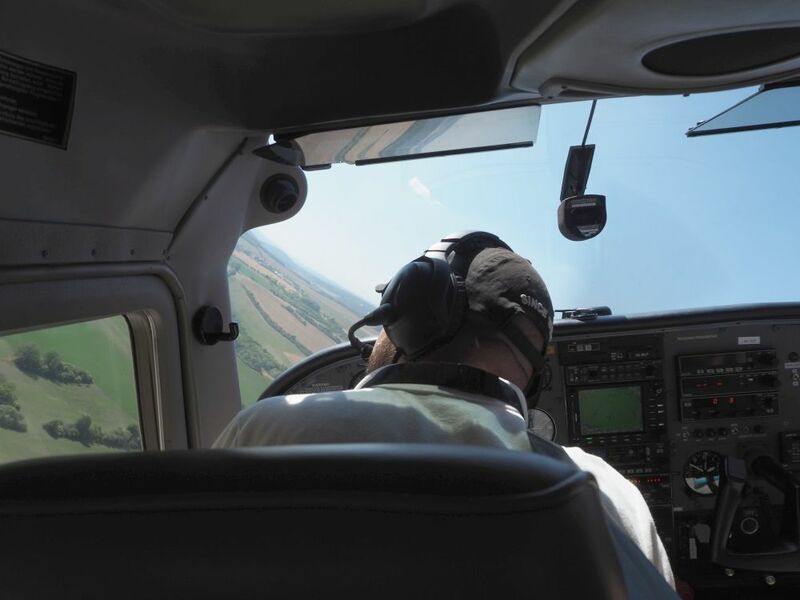 You can take an introductory flight (including trying your hand at the controls! I’m so glad we didn’t do that! 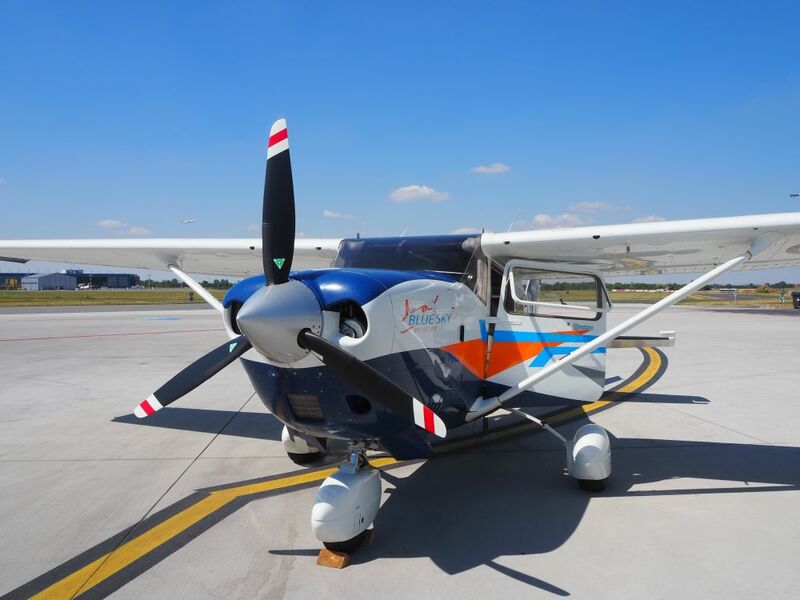 ), hire a plane to use as a taxi, or rent a plane if you already have a pilot’s license or for a sightseeing flight like we did. If you enjoyed this post, please share it to social media. You can also pin the images below, which are formatted for Pinterest.